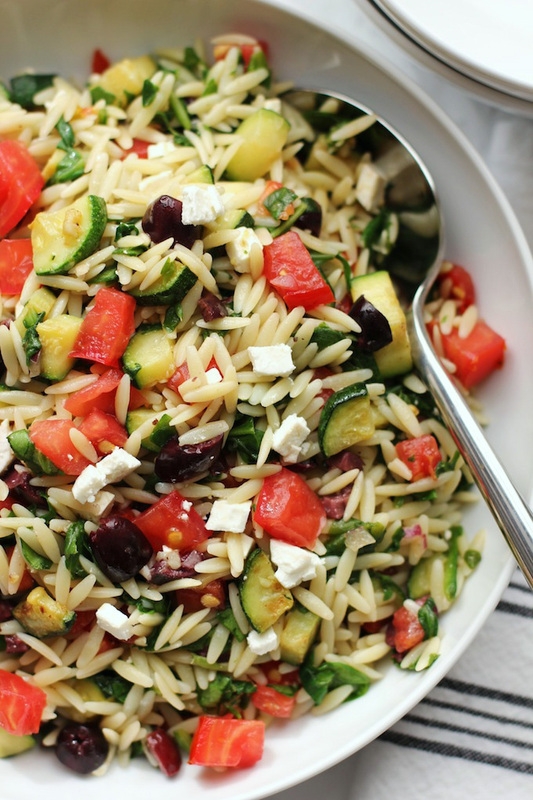 This mediterranean orzo salad is an easy, colorful, zesty pasta salad. It’s packed with baby spinach, fresh tomatoes, sautéed zucchini, kalamata olives and salty feta – all tossed with a lemony garlic vinaigrette. Recipe updated 11/28/17 to include nutritional information. This is a versatile pasta salad – you can serve it as a side or main dish, it also works well either warm or cold. I tend to make extra since this orzo salad refrigerates really well – making it an easy lunch to pack up and bring to work the next day. Originally, I sautéed the spinach and added it to the pasta salad. The only problem was that the spinach tended to clump together making it hard to evenly distribute throughout the salad. So I tried a new technique this time. I roughly chopped the spinach, added it to a large bowl and then, when the orzo was done cooking, tossed it with the chopped spinach and the lemony garlic dressing. The fresh spinach will wilt and the orzo will cool slightly. This serves two purposes – it saves one cooking step and orzo tends to work better at room temperature rather than piping hot. Some people may mistake orzo for rice but this small oval shaped pasta can be found in the pasta aisle at the supermarket. Orzo expands when it cooks, so it may not look like a lot when you first measure it out, but it doubles in size when cooked. This dish comes together quickly, so do all your prep work first. Chop all the veggies, dice the feta, mince the garlic and prepare the dressing. Have everything ready and on hand – this will make assembling the dish easy and straightforward with no rushing. If you want a vegan version – swap out the feta cheese for some capers. Want to boost the protein in this dish, try adding some black beans or chickpeas. Mediterranean orzo salad – a colorful, easy, versatile orzo salad. Made with baby spinach, fresh tomatoes, sautéed zucchini, kalamata olives and salty feta. Great as a main meal or side dish. 8 twists of pepper from a pepper mill. Bring a large pot of water to a boil. Add orzo and bouillon cube. Cook as per package directions. Roughly chop spinach and add to a large bowl. Make salad dressing by combining ingredients and whisking. When orzo is done cooking, add to the large bowl with the chopped spinach. Pour dressing over orzo and spinach and stir continuously until spinach has wilted and dressing has coated orzo and spinach – about 1 minute. Heat 1 tbs olive oil in a non-stick sauté pan over medium heat. Sauté sliced zucchini and minced garlic for about 6 to 7 minutes until slightly browned. 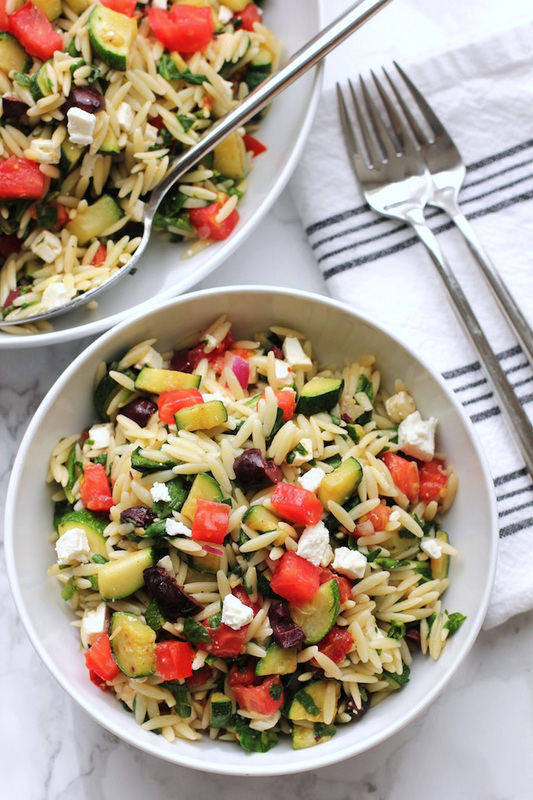 Add sautéed zucchini, diced tomatoes, feta cheese, minced olives and red onion to orzo. I love anything with Mediterranean flavors but I’ve never thought to add it to orzo…such a great idea! Thanks, Beata – I’m a big fan of Mediterranean flavors, too. I seriously need to try cooking with orzo! This looks delicious! I love how many vegetables you packed into this! Looks so light and fresh! Thanks, Cheyanne – definitely add a little chicken or if you want to keep it vegetarian try some chickpeas or black beans. Thanks for the pin! I am always in the mood for an orzo salad like this!! Such fresh and clean flavors and I love everything that has olives and feta in it! Thanks, Izzy – I agree about olives and feta – I think most of my salads (and a bunch of pasta dishes) have them in it. This salad looks great. I love that it makes great leftovers. Thanks, Kathy – I’m all for salads that work for two meals! You’ve done it again! 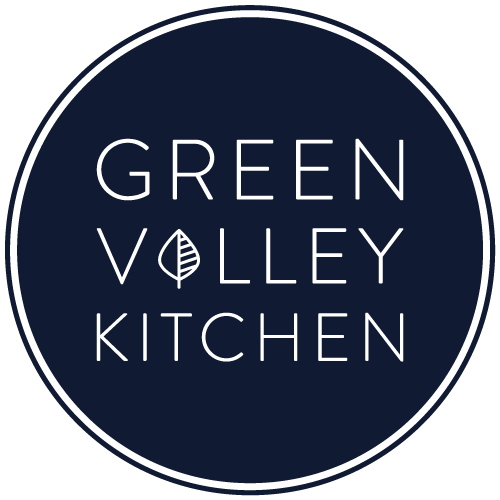 I adore your salad recipes, Geraldine and this one is no different! Letting the Orzo slightly wilt that spinach is so smart. Love the option to swap the feta with capers too! What a great idea! Those tomatoes are looking quite tasty. I just picked some up from the farm.. they’re telling me the tomatoes are almost done… I’m going to miss them terribly!! Thanks, Traci, you always leave the nicest comments! My tomato plants are still going – but that’s only because its been so hot here. We’ve just been hit with some cool weather so that may be it for my plants this year. Looking forward to growing more next year though! This salad was pretty much made for my husband, it has all his favorite foods. I’m going to have to make it 🙂 And I love the spinach trick you shared – so smart! Thanks, Meghan – I hope you and your husband enjoy it! I love anything with Mediterranean flavors Geraldine! This salad sounds wonderful! LOVE the colors too! Thanks so much, Mary Ann – I’m a big mediterranean fan too – love the flavors! I am a huge fan of Mediterranean flavors and I love orzo! 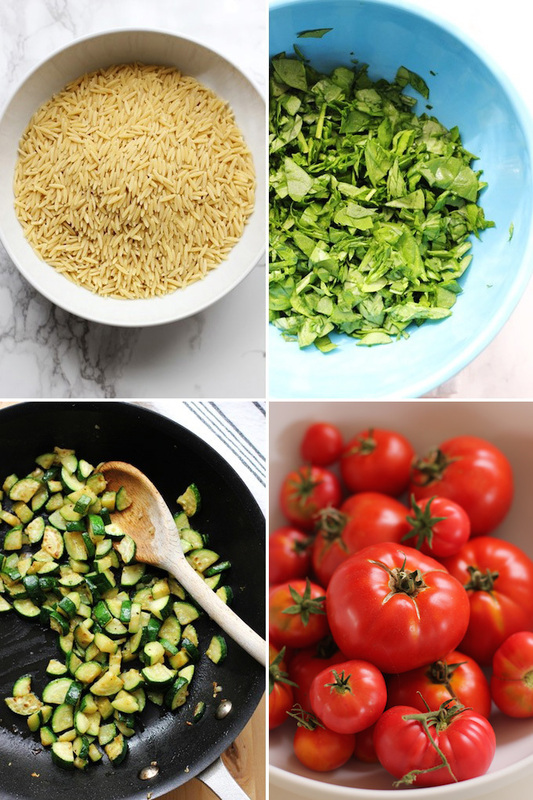 Thanks for the tip on throwing the chopped fresh spinach in with the cooked orzo – great idea! Such fresh and lovely photos once again! Love it, my friend! Sometimes I forget about orzo – maybe because it doesn’t look like pasta – but it’s so good. Have a great day, Annie! Thanks, Julia – I just figured out the spinach trick and will be using it in other dishes soon! Hope you had a fantastic time in Japan – loved your IG photos from your trip!